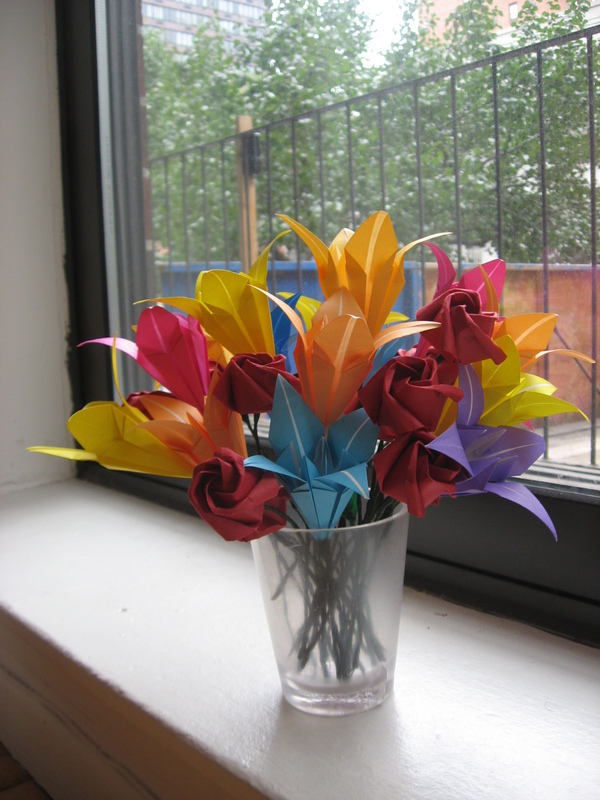 I have been making loads of origami flowers to decorate a big party. 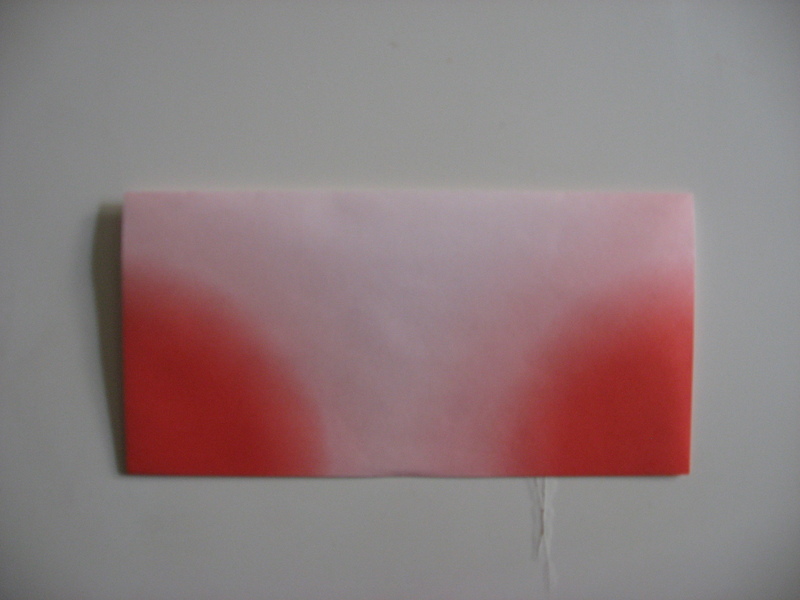 I thought I would share the process. 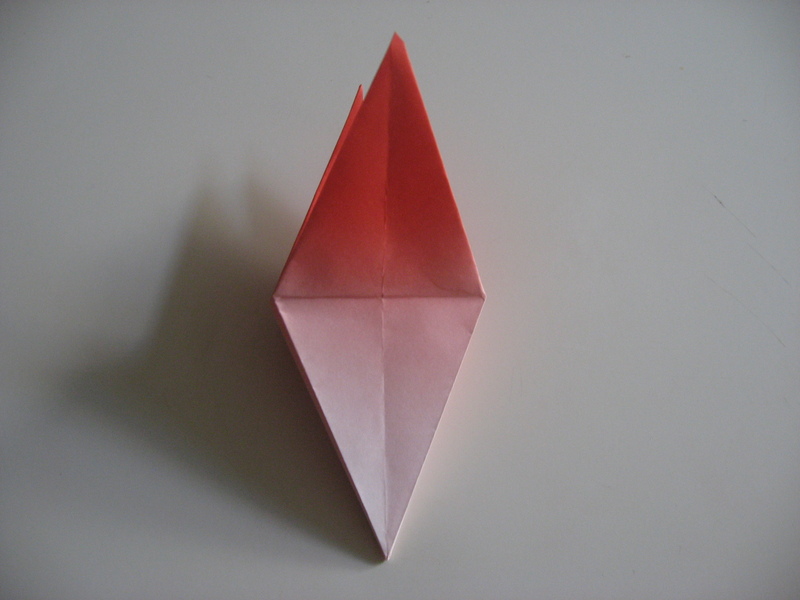 The tutorial is in two sections to make it less massive. 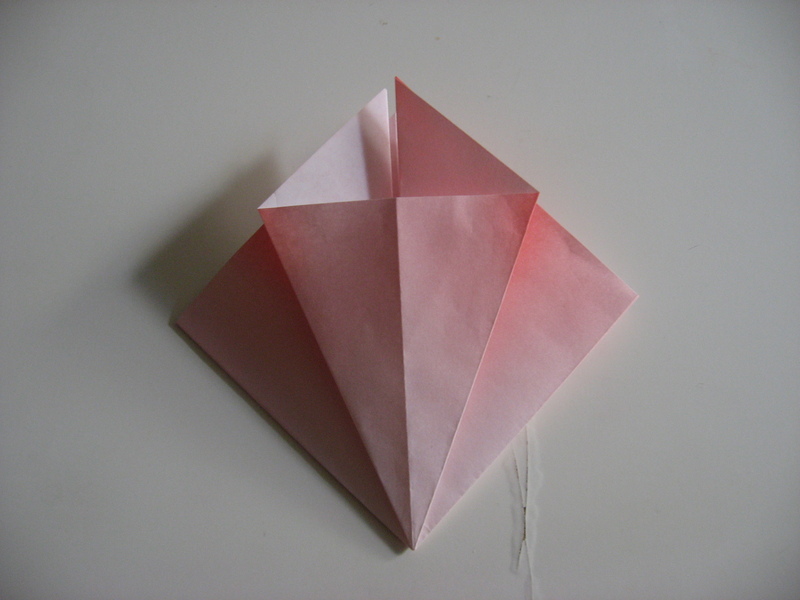 This part covers how to make the flower. 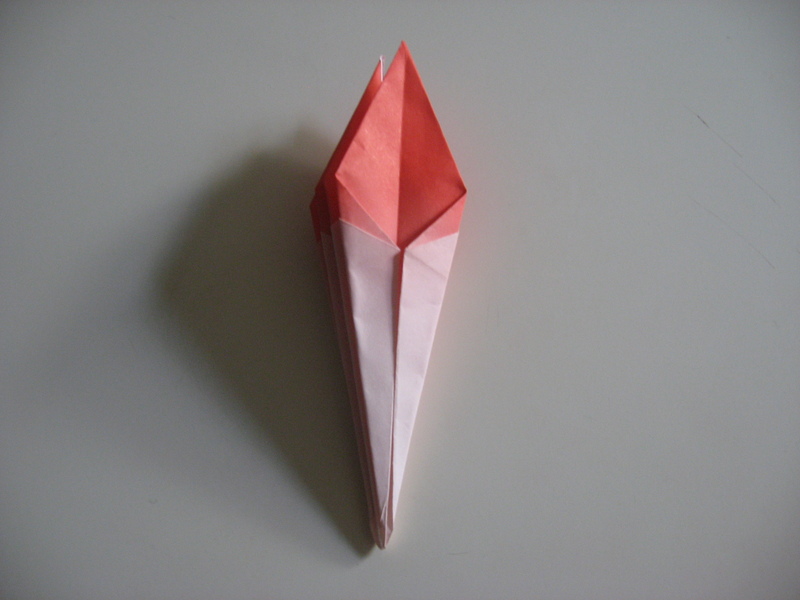 The second part covers the stem. 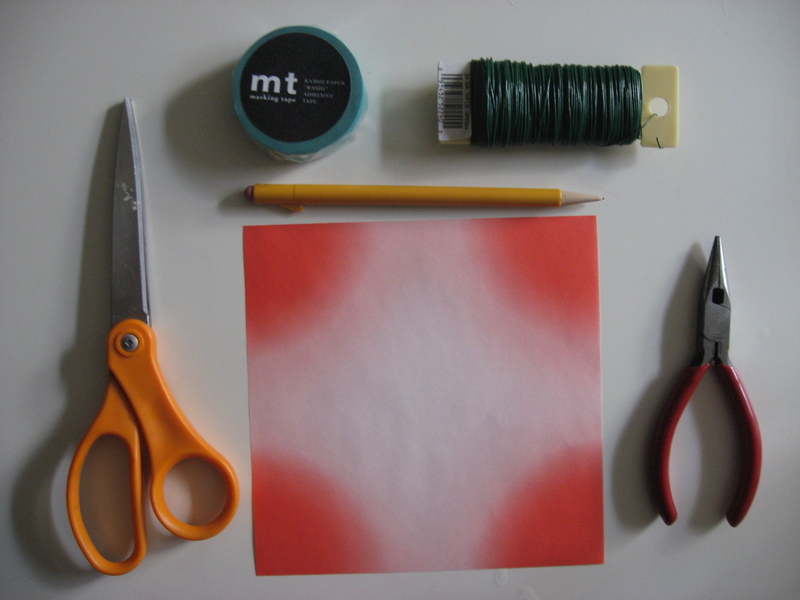 At the end of this section there is a video of the entire process to help with the trickier steps. 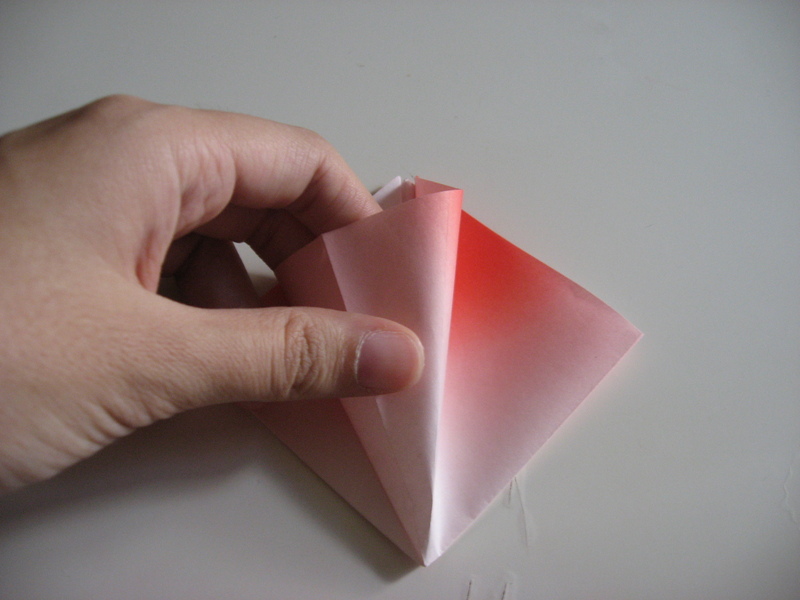 For this first part you will only need a piece of origami paper and a round stick. 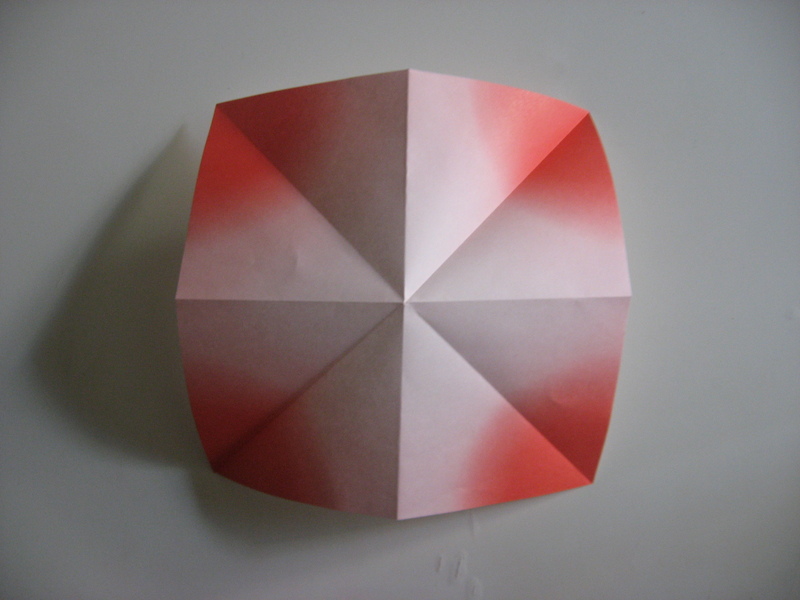 My paper is 15 x 15 cm and white on one side. 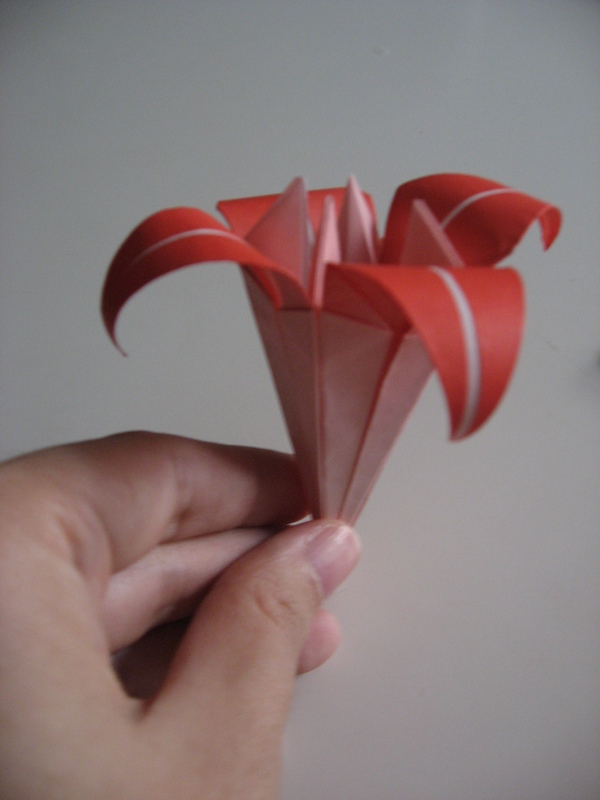 To curl the petals, I used a a rounded mechanical pencil. 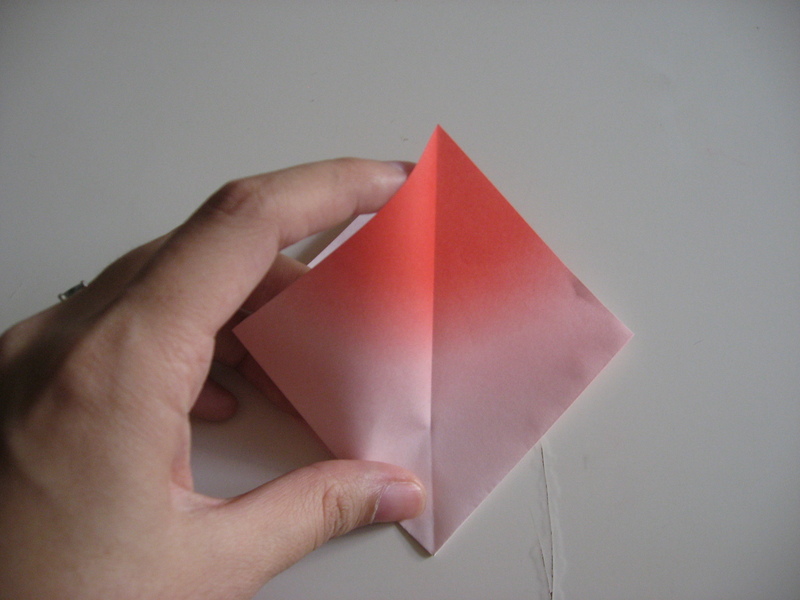 Fold it in half, with the color side on the outside and the white side on the inside. 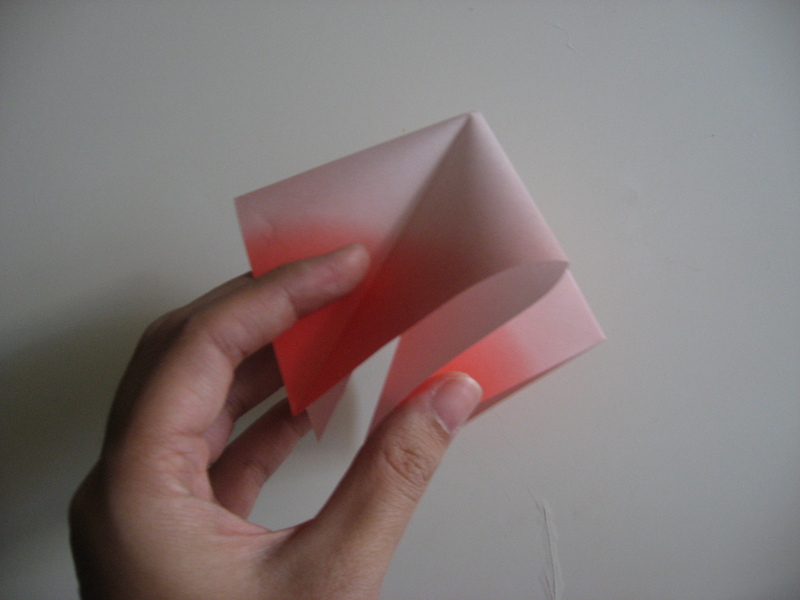 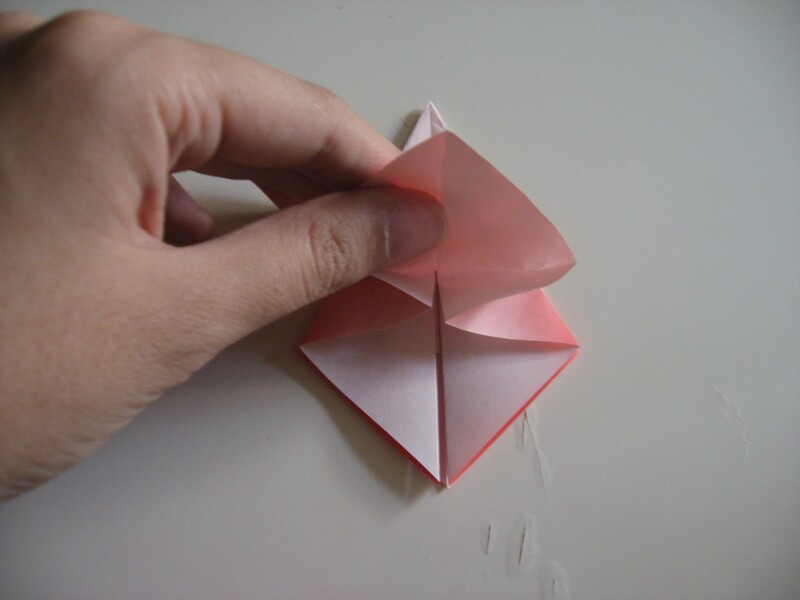 Unfold the paper, and fold it in half again so that your paper is divided into four squares when laid flat. 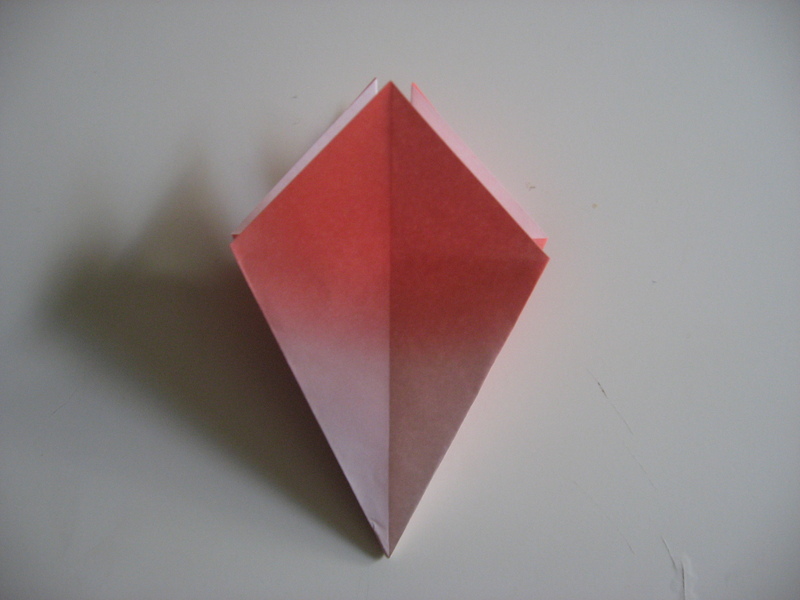 Next, fold the paper in half on the diagonal, this time with the white side of the paper on the outside and the color side on the inside. 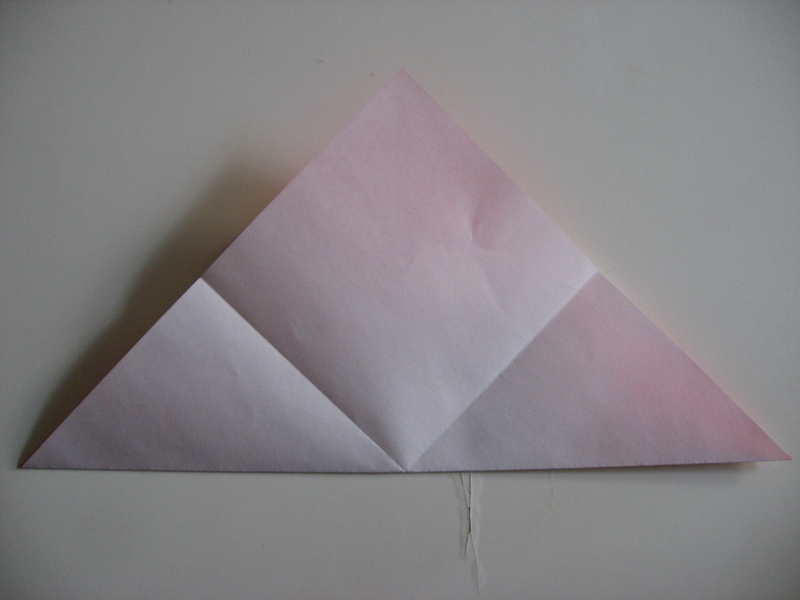 Reinforce the folds by pressing everything flat, and then turn the paper so that the side with the tips coming apart is at the top. 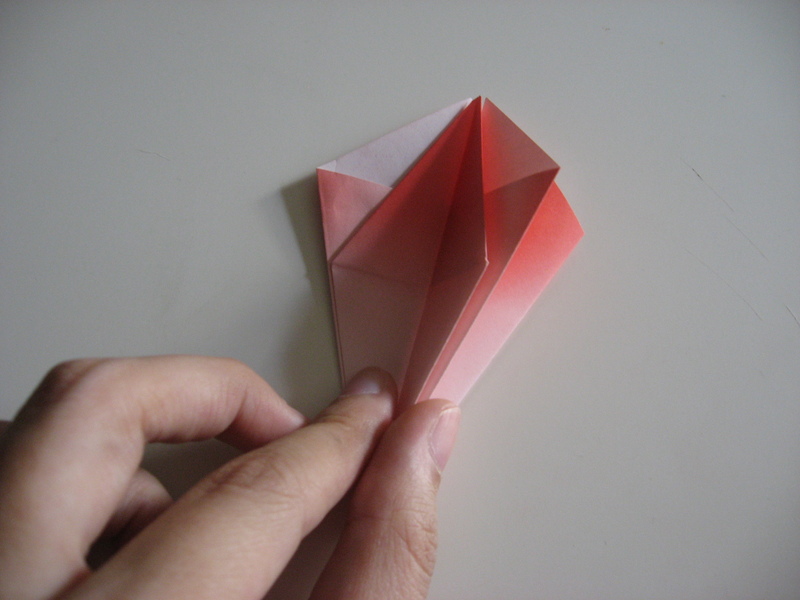 Take one flap (not two) and fold it in to the center line so that the edge of the paper lines up with the center line of the origami. 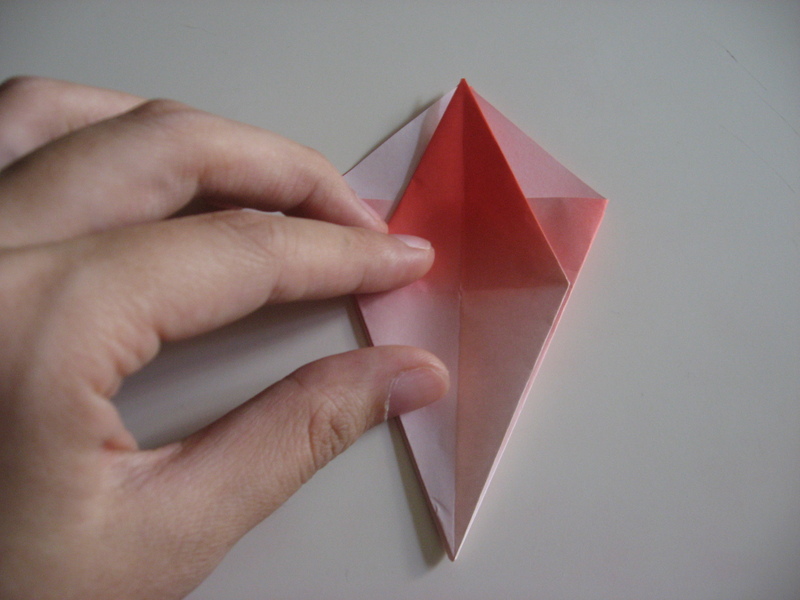 Fold the right flap into the center, so that the edge lines up with the center line of the origami as previously. 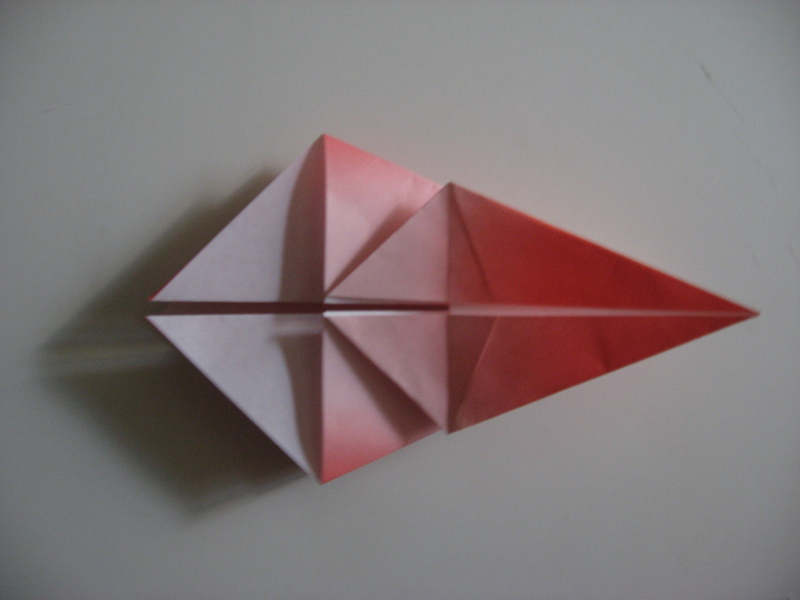 Turn the entire piece upside down, so that the open flaps are pointing towards you. 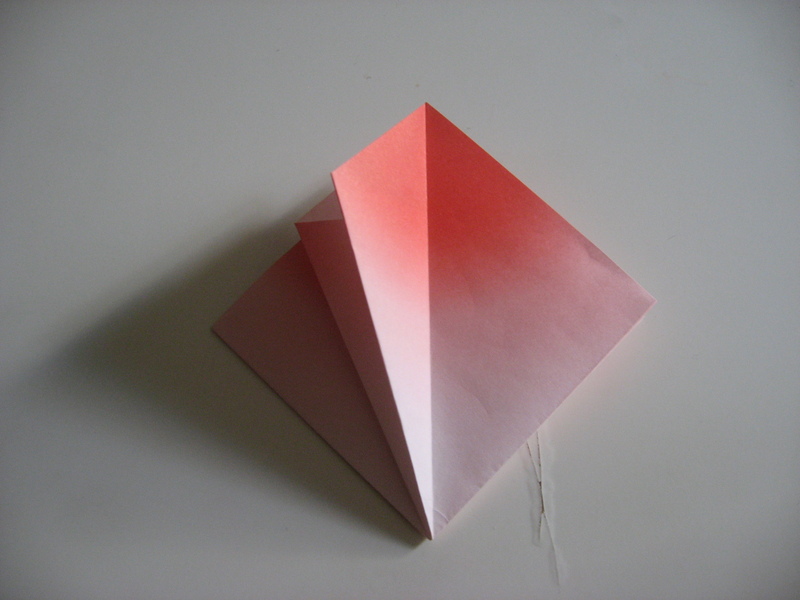 Take the point you just created and fold it back up. 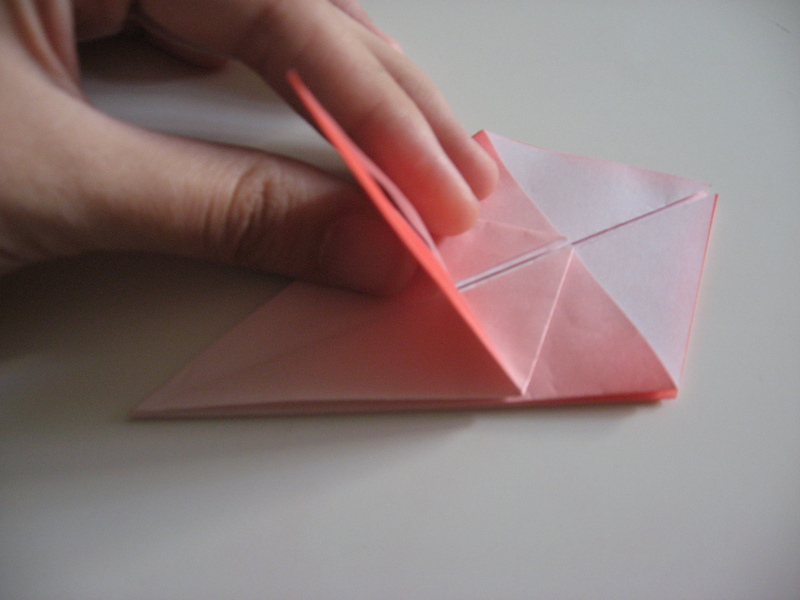 Flip the paper over and repeat the process of opening the flap so the tips meet, etc. 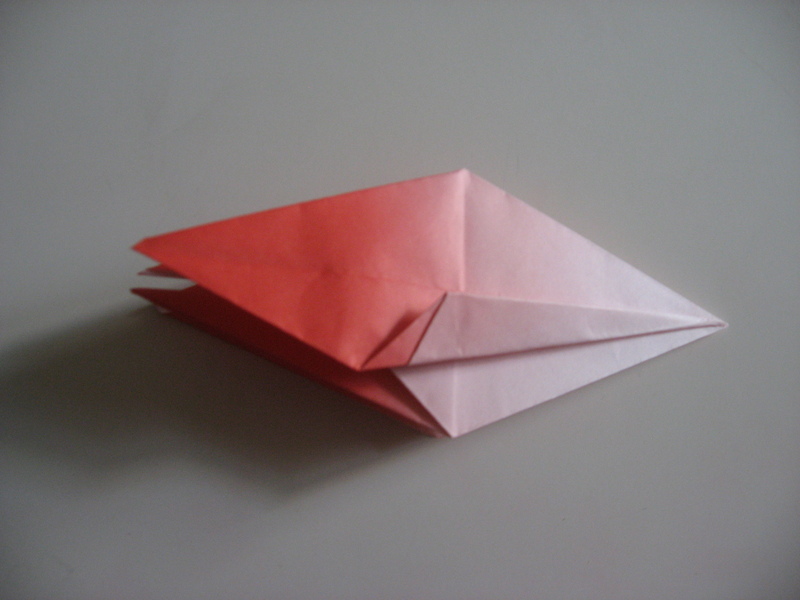 Then take the right flap and fold it over on each side. 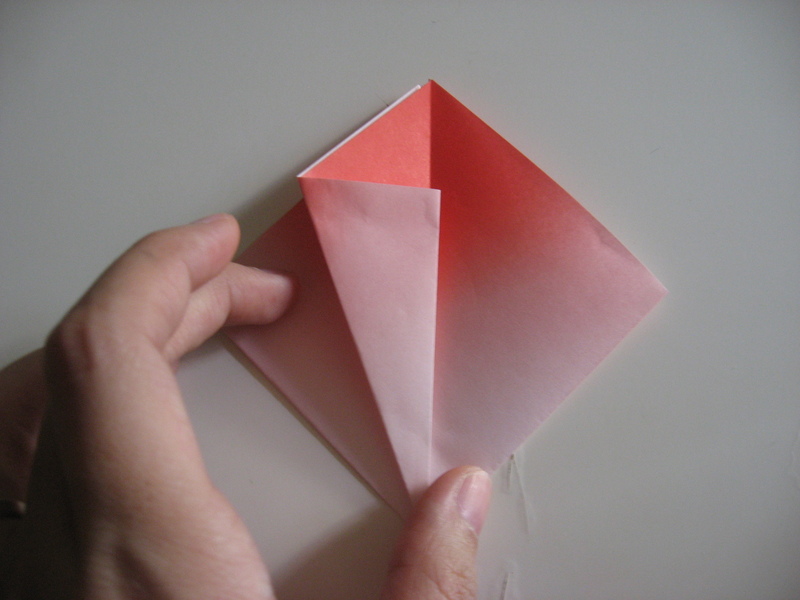 Take a single flap from the left side and fold it in so that the edge matches the center line. 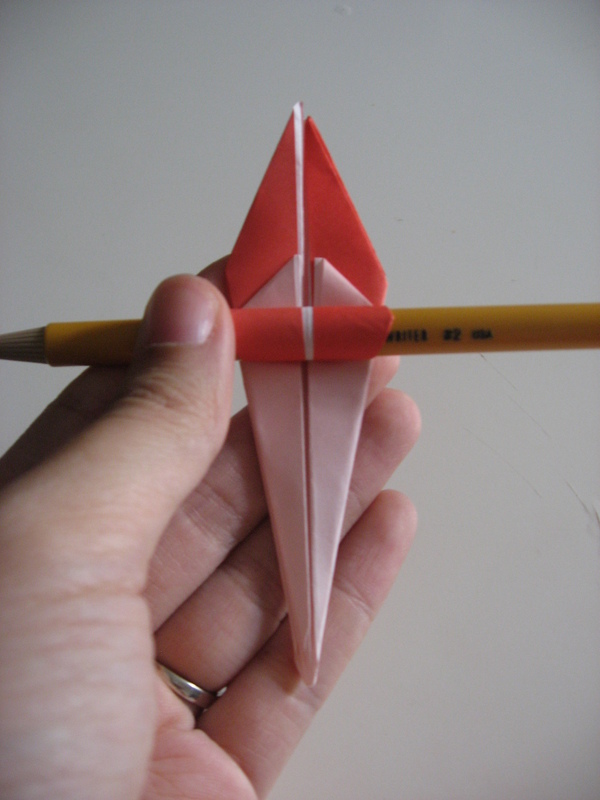 To finish the flower, take the pencil/pen and wrap the top flap of the flower around the pencil to give the petal some curl. 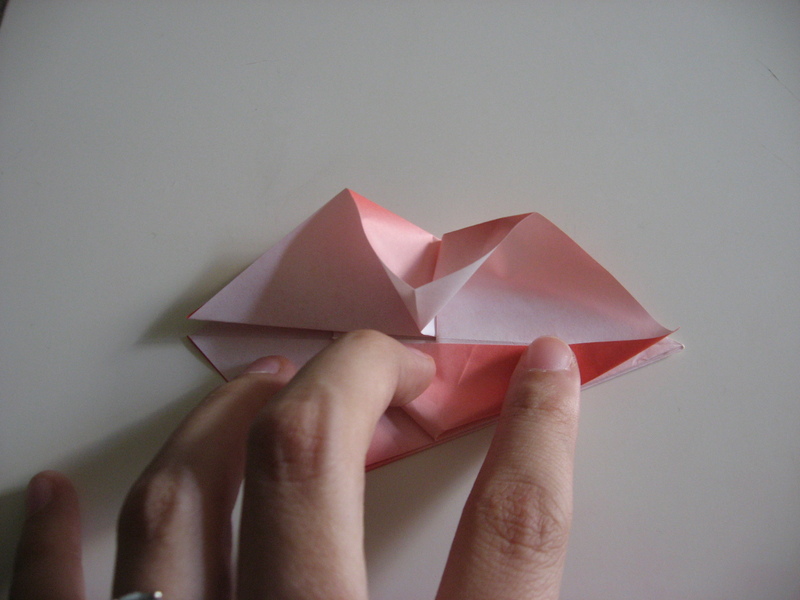 Curl the remaining three petals to complete the flower. 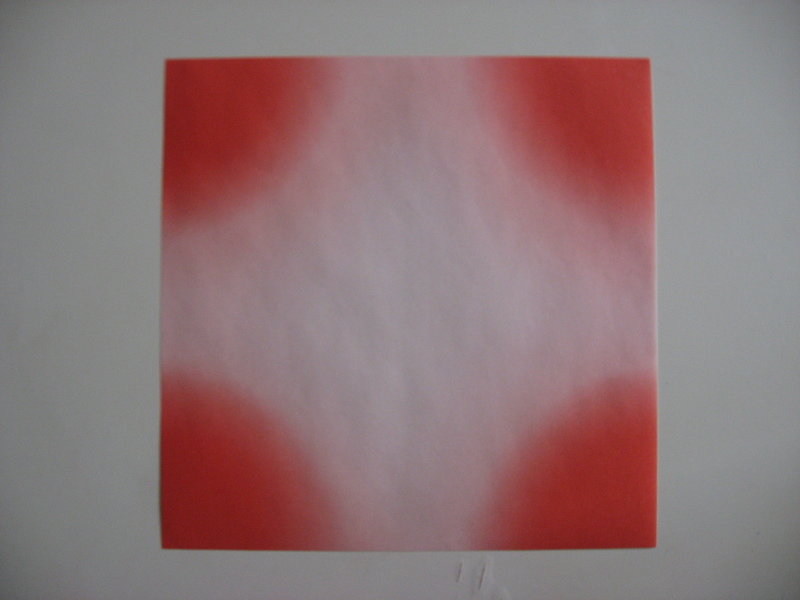 As promised, here is a video to help illustrate the difficult steps of the process. 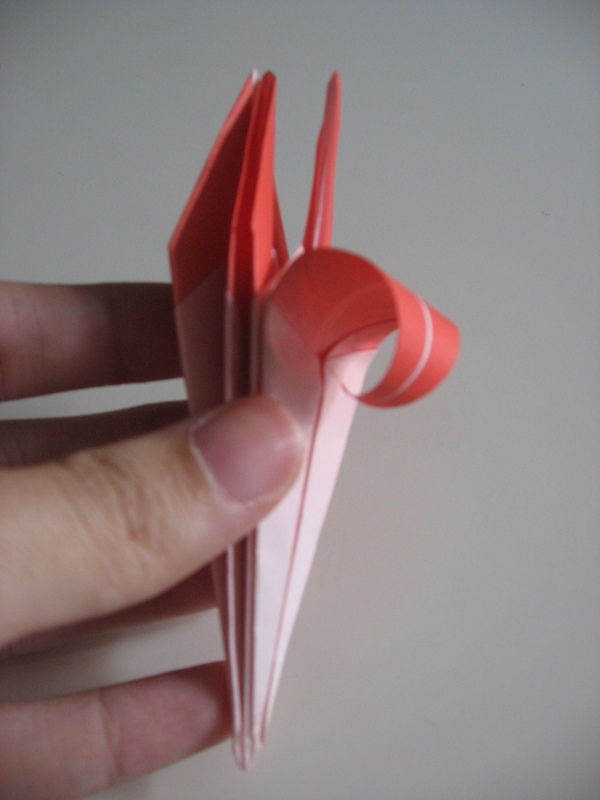 I added music to block out obnoxious background noises, feel free to mute. 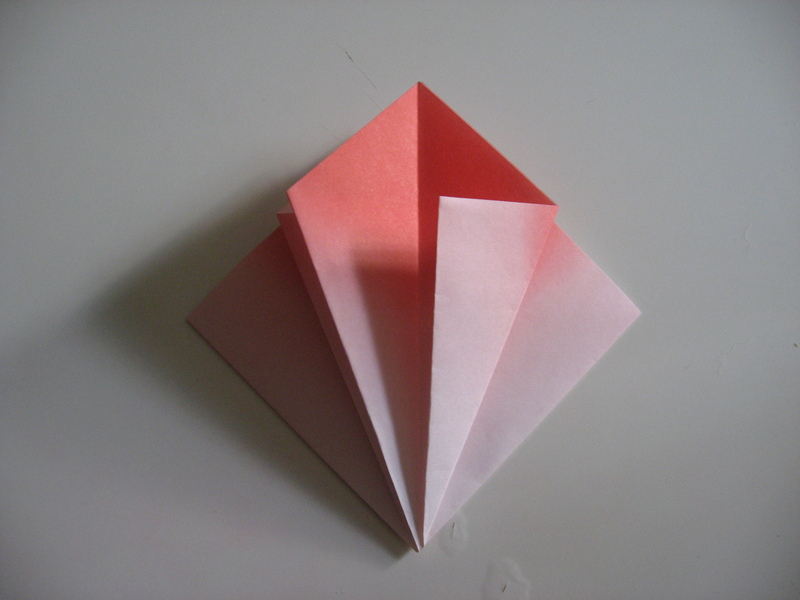 Part II illustrating how to create a stem for the flower can be found here.